The Adventures of Cassie: A Long Post! First of all, look at what I got on Saturday! So far I've spun 2 skeins of yarn. The first one is a bit lumpy and disheveled, but I'm getting better. 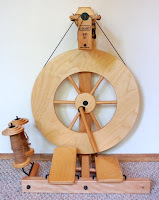 Tonight I am working on spinning up some green/yellow/brown roving into some worsted weight singles. I still think I am adding too much twist, so it may be plied into a thicker yarn after I am done. We also visited D-ville yesterday to do our pre-marriage meetings and also got to catch Nate's little brother play in his praise band, and act in his last performance of, "You Can't Take it with You." 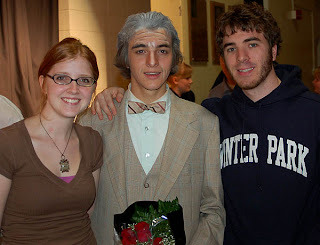 He did a wonderful job, and we were glad we got the opportunity to see him. Awww... 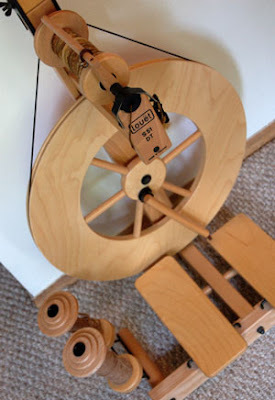 I want a spinning wheel! I hope you have lots of fun with it. :) I know I would go fiber crazy! Congrats on your new wheel!